The activities and the associated formalisms for modeling and programming have many commonalities. 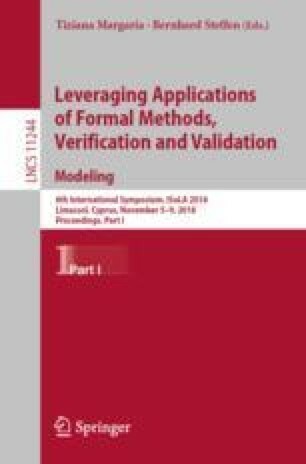 In this paper we emphasize this point of view by modeling two examples in the programming language Scala, which have previously been modeled in the VDM specification language, and the Promela modeling language of the SPIN model checker respectively. The latter Scala model uses an internal DSL for hierarchical state machines, and a simple randomized testing framework exposing the same errors as found with SPIN. We believe, as the examples illustrate, that this use of a modern programming language for modeling is promising, especially if utilizing internal DSLs. The research performed was carried out at Jet Propulsion Laboratory, California Institute of Technology, under a contract with the National Aeronautics and Space Administration.